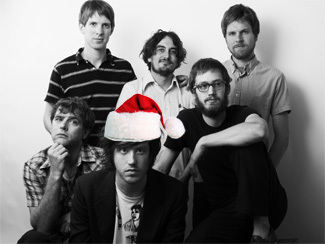 Christmas comes early for Okkervil River fans. In the spirit of the season, the band has made a special “mix tape”, consisting of eight cover songs and one Okkervil original recorded whilst on tour over the last couple years, available to download for free off their website. Featuring songs by John Cale, Jimmy Webb and Serge Gainsbourg, if you don’t know the originals – which I’m not too proud to admit I don’t – Will Sheff has provided detailed liner notes explaining why these songs were worthy of reinterpretation. Yes, liner notes. And CD art. Because after you download MP3s, you burn them to CDs and listen to them on your hi-fi, right? That’s what the kids do these days, right? Further, as Sheff says in a message board post, the only press he’s doing about the release will be responding to questions sent in via email with the composite final “interview” to be posted online on Friday. No word of lie, this is probably the best holiday surprise I’ll be getting this year. Billboard talks to Jeff Tweedy about plans to explore every corner of Wilco’s discography during a five-night stand in Chicago next February. Even if you can’t be there – as I can’t – it’s exciting news as it hopefully means that more older material will seep into the band’s repertoire during future tours. But if you CAN be there… you have my envy, a fluorescent shade of green. So the final show for the Horseshoe’s 60th anniversary has been announced and as implied repeatedly over the past couple weeks, it’s Blue Rodeo next Monday, December 17. Tickets are $30 with all proceeds going to the Parkdale food bank, going on sale at 1PM the day of the show at the ‘Shoe’s front bar with the band will be playing three sets over the course of the night starting at 9PM. I’m planning on queuing up to try and get one – if I succeed, would anyone want the second? There’s a limit of two per person. Also announced – Steve Earle will be playing Massey Hall on March 4 with the presale starting this morning at 10AM. Everything I’ve read implies that this tour will be Dukes-less and in the same configuration as I saw at the Rehearsal Hall taping last month – namely Steve, Allison Moorer and a DJ. A bit undersized a crew for a venue like Massey Hall, but that’s how Steve’s rolling this time around. Full tour dates here. Ra Ra Riot is coming to the El Mocambo on January 26 with The Coast and The Virgins. Tickets for that one are $8.50 in advance. Kim Deal tells NME why a new Pixies album didn’t – and probably won’t ever – happen. Harp and City Pages talk to Nellie McKay. She’s offering a free seasonal song for download but soliciting donations for the “Nellie McKay Disaster Fund” via her website and The Current has also got a radio session available to download. She’s currently on tour with Aimee Mann, who talked to the Northwest Herald about her own Christmas album from last year and her new record due out in March. The AV Club interviews Conor Oberst of Bright Eyes. Aaron Dessner of The National talks to Drowned In Sound about the trials and tribulations behind making Boxer. Dirty On Purpose don’t release their new Like Bees EP until January 15, but they’ve got a new song available to download for free over at RCRDLBL that’s going to be part of a digital-only EP called Dead Volcanos. But let me just say that Like Bees is a real treat, highlighting the wide breadth of the band’s abilities, and bodes very well for the their next album whenever it hits. The Denver Post chats with Voxtrot’s Ramesh Srivastava. Both Salon and The Village Voice have things to say about Brit Box. And not especially nice things, either. Which reminds me – congratulations to Pedro on winning my Brit Box contest but thanks to everyone who entered – thems was some good reading. Wired chats with Charlatans UK frontman Tim Burgess – yup, they’re still around – about their decision to give away their latest single online. A strategy, the piece points out, that was announced hours before Radiohead revealed their In Rainbows strategy. And with regards to Radiohead, NME talks to Colin Greenwood about the lengths the band went to to prevent the record from leaking in advance, The Guardian solicits interview questions from the band’s fans and The New York Times ran an extensive feature on the band this past weekend. Any excuse to post some Lucky Soul… like the band performing “Lips Are Unhappy” live on sub.tv. Oh come to North America, please come to North America. Richard Hawley gives Harp a guided tour of Sheffield which ends not in a pub, but a relish factory. The AV Club lists off 23 songs that could stand to never be covered again. Arrested Development: The Motion Picture? I would gladly take that second Blue Rodeo ticket off your hand if successful. the whole new Charlatans album will be given as for free as well, early next year. I asked the band’s management about that Amazon release date and they said it’s incorrect – the EP isn’t out till Jan 15. If you ordered it, you’d probably just end up waiting a month. Thanks for the Okkervil River link, Frank. You just made my … day? … night? What’s 5 am considered when you still haven’t slept?